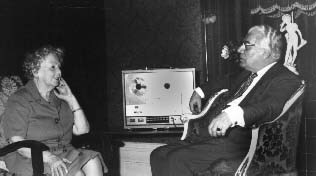 On 20th August 1962 a voice manifested in the seance-room of British medium Leslie Flint (see photo)which claimed to be that of the late Oscar Wilde. The famous Irish poet and dramatist died in Paris in 1900. By that time he had fallen in disgrace by the prudish society. Once he was acclaimed as an artist of brilliant wit and exuberant fancy. As a dramatist his work was distinguished chiefly for brilliant epigrams. His plays included "The importance of being Earnest". He was the author of "The Picture of Dorian Gray". His life has been portrayed splendidly by actor Stephen Fry in the film 'Wilde'. "My name got me into a great deal of trouble when I was on your side!" Mr.Woods interjected: "When we play these tapes to other people, you see, they ask who it is." "You can tell them it is Colonel Bogey!" "Mr.Wilde can you tell something of your life on the Other Side? What are you doing? "I must admit it's a relief to be asked to discuss one's life over here, in preference to one's life when on Earth, because in any case my life on Earth is pretty well known among the gossip-mongers! If I were to say to you that my life here is not unlike my life on Earth, you'd probably be very horrified! But it happens to be perfectly true, and I've no regrets about it whatsoever..... My reputation does not worry me, but it seems to worry a hell of a lot of people on your side! More money has been made out of my reputation since my death, than ever I was able to make out of my plays, which goes to say that sin is very successful!" "This I do deliberately because there will always be people who'll say 'How do we know that this was Oscar Wilde?' And so I'm expected to come back very much the same, with the same attitude towards life, and towards people, and to say the same sort of things, that would be expected of me." Woods: "Have you met Bernard Shaw on that side?" "Oh, I have met Shaw, of course I've met Shaw. What a man! Extraordinary character - brilliant, if rather - well, I'd better not say these things. I'm supposed to be to some extent developed!" Woods: "You still write plays on that side?" "Oh, one still writes, one still continuous. Our world in some senses, as no doubt you have heard, is very similar to your Earth. We have all manner of scenery which you are accustomed to, even more beautiful. Nature as you know nature exists here, but the worser aspects, or the more irritant aspects of nature are non-existent to us. For instance, we don't have the pests, such as flies, earwigs, and all the irritating things that nature concocts to annoy man. These things seem to have disappeared fortunately. We seem to have all the beauty and loveliness of nature without the petty irritants. No more swatting flies! Oh, I used to know a woman once, who used to love sitting all the afternoon in a chair with a swatter, and she had a swatting afternoon! I often wonder what she must be doing here without a swatter, without the flies to swat! Oh, a long time ago, things have changed. Ik look at London and hardly recognise it. Thank God, I lived before my time!" (Incidentally, George Bernard Shaw was one of the few critics in his lifetime who praised Wilde as 'our only thorough playwright. He plays with everything: with wit, with philosophy, with drama, with actors and audience, with the whole theatre.'. Shaw has also come through at seances of Leslie Flint. 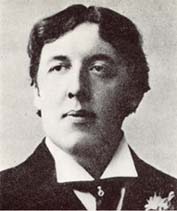 Another excerpt of Oscar Wilde's communication in streaming Real Audio may be heard by clicking here. Turkish: Biz bir ruhu var ruh ? Opening date this page: 26 August 1996. Revised 17 July 2018.